The Turkish Academy of Sciences (TÜBA) is a scholarly institution founded in 1993, attached to the office of the Prime Ministry and later (in 2011) to the Minister of Science, Industry and Technology with scientific, administrative and financial autonomy. Its aims are to establish the criteria of scientific excellence in Turkey, to encourage and foster scientific endeavours, to ensure that scientific principles be applied in all spheres and to create an environment of debate so that basic social strategies may be defined in the light of scientific and technological data. 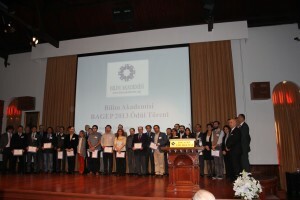 The Academy strives to promote adoption of and strict adherence to scientific ethics both by its own members and by the whole of the Turkish scientific community; freedom of expression; culture of debate and the integration of the Turkish scientists with the international scientific community. The Science Academy (Bilim Akademisi) was established in Istanbul on 25 November 2011, as an independent non-governmental entity with a mission to promote, to model and to protect scientific merit, excellence, independence, and integrity. The Science Academy was founded by former members of the Turkish Academy of Sciences, following the decree by the government of Turkey in August 2011, which changed the status and structure of that Academy and allowed the appointment of the majority of new members by government bodies. The Science Academy gathers the best minds of the scientific community of Turkey with a view to promote and protect excellence, method, tradition and practices, freedom, and honesty in science. It endeavors to maintain and to expand the already considerable potential in Turkey for scientific research and publication.